As a Ba'al Kri'ah (Torah reader), I sometimes find it difficult to locate the start of an aliyah (reading) on Shabbat, esp. in parshiot Vayetze and Miketz where both of these are one contiguous parsha (paragraph) with no breaks. Would one be allowed (before Shabbat, of course) to mark in the side margin where the aliyot are located? I've see sofrim sometimes mark in pencil something in the margin that indicates the place for a correction or some serial number that they need for their records (I guess when scanning). So, I'm uncertain if there is an exception for sofrim in certain occasions and, whether only an erasable marking may be used (like an erasable marker or pencil) or may one use a permanent marker as well? The sefer Piskei Teshuvos (OC 32:12-13) writes that l'chatchila one should not write anything on the margins (or anywhere else) of the sefer torah. If one did write something, even a sofer marking a mistake, he should erase it. However, as he writes there, b'dieved it would not be a problem. We should not be adding anything to the sefer torah. The reason is because the sefer torah has to be the same way that we got it from Moshe Rabbeinu. The same applies to a mezuzah in not adding anything to mezuzah. Sources: Y.D. 274-7, Taz ibid 7, not to make markings to separate the pesukim or to make nikudos (vowels) in the sefer torah. 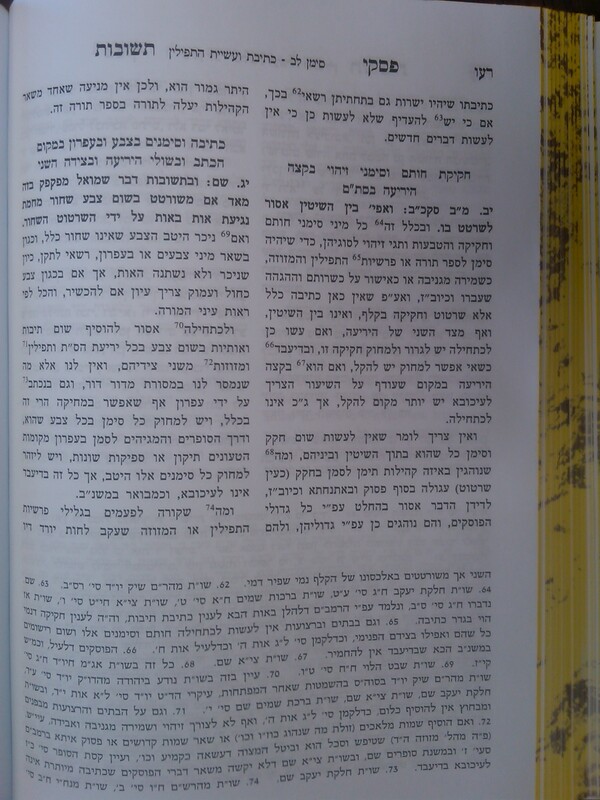 Rema 288, See Rema O:CH 691-2 regarding a megillah. Not the answer you're looking for? Browse other questions tagged halacha sefer-torah writing-printing safrus . What does it cost to write one's own Sefer Torah - and how long would it take? May one use a Sephardic Torah in an Ashkenaz minyan? When does a Sefer Torah become a Sefer Torah? Would a woman be permitted to write a sefer Torah?